never knew i could get so lost in school and work. barely a moment's rest, but never a dull moment. what made me come back...at a time such as finals?? study-procrastination led me to a campus blog that featured a CU student's food blog. honestly though, the tumblr is cringeworthy! mediocre recipes, processed ingredients, improper cooking techniques, just a mess. NOW is the time to get down and dirty. time to brush off the rust i suppose. did this after skimming a thomas keller recipe while in barnes and noble. caramelizing onions is for the patient! low and slow, and i mean it. low heat, don't crowd them, replenish with water as needed, and keep the lid on. for hours. the sugars in the onion caramelize and turn brown (think: making caramel from white sugar), then to mush. only the tastiest brown mush. and your apartment will smell amaaaazing. after this, essentially the rest is beef broth, thyme, and a light hand of salt. ...would be a shame to mask the sweet flavors that took hours to develop! the final (and BEST) step is to add croutons and cheese. 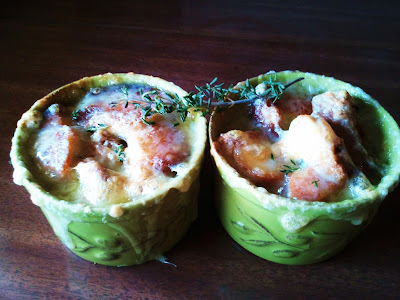 used a mix of gruyère and comté.. it is french onion soup after all. emmentaler could work well also. dark chocolate cake + chocolate sour cream frosting. does it get any easier / tastier? ok this photo looks like strawberry jam...alas it is not. 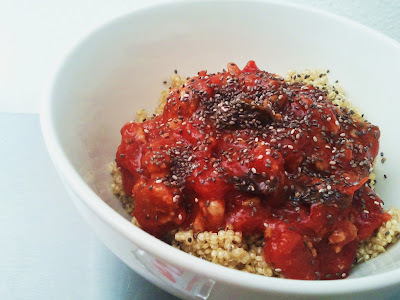 turkey meat sauce (tomatoes, spices, ground turkey, etc) over quinoa, topped w chia seeds. love using chia seeds because not only am i reminded of chia pets, they are packed with omega-3's and add interesting texture and mild nutty flavor. 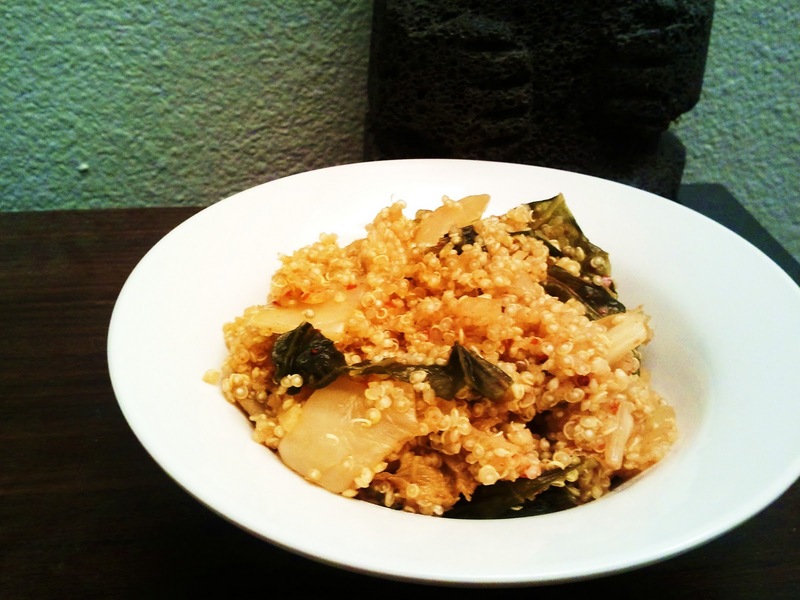 in my 22 years of ravenous white pasta eating, quinoa is a great (super healthy!) substitute. did you know it's a seed? gluten free? has all 9 amino acids? a completely delicious complete protein. not all good food looks good. because some looks like this. 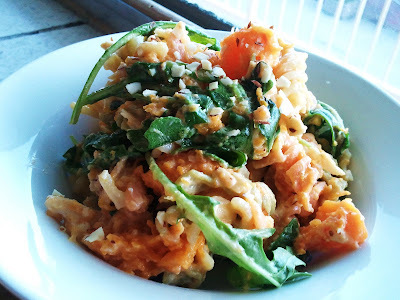 rotini w chèvre, gorgonzola, butternut squash, toasted almonds, fresh basil and arugula. stinky gorg and pungent arugula help balance the heavy emphasis on creamy sweet flavours. adding the basil and toasted nuts almost feels like a deconstructed pesto! all in all, a good debut to pasta tuesdays at 420. not to mention very fall-esque! 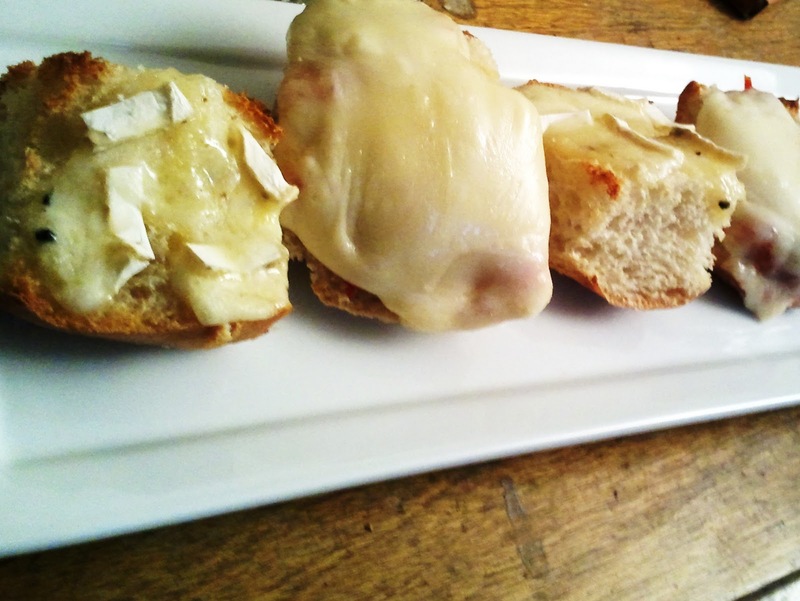 cheesy toasts: one idea, endless possibilities. elegant and sumptuous juxtaposed with simple nostalgia. her red rice bibimbap is just one example of her creative uses of grains. i saved some of the overripe bits at the bottom and fried it up w some quinoa. 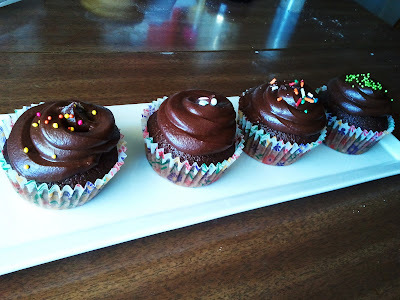 as exemplified by chocolate cupcakes, simple often cannot be beat. 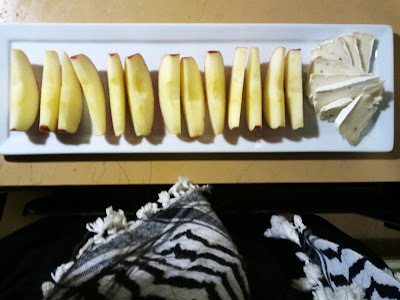 apples in a row and a stack of brie. nom nom. 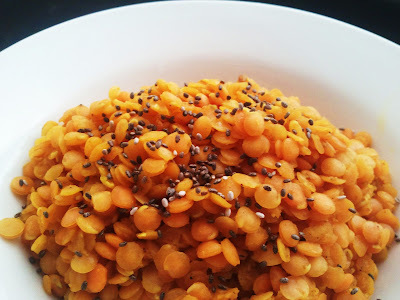 dry-curry red lentils w chia seeds. vitamin flood much needed during final exams!! and i am never sure how to conclude........out.